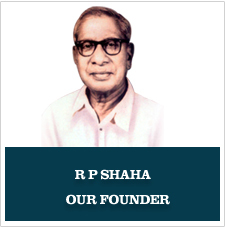 Along with healthcare, R P Shaha recognised the importance of education, especially for women, in making them self-reliant. In 1944, he established Bharateswari Homes, a residential school for girls. The home is renowned for producing well-rounded, socially responsible students who have gone on to excel in their respective fields. Students are admitted on the basis of performance in a selection process which includes an admission test. Bharateswari Homes is a residential school for girls, starting at class five and going up to class twelve. It is compulsory for students to be residents of the hostel. Besides studies, the girls are required to do regular menial work so that they can acquire mental maturity and a hard-working attitude. The students take part in all cleaning, cooking and washing activities. The Homes has a total of 1200 seats, and students are selected regardless of religion, caste or social status. The aim is to inculcate discipline in its residents, enabling them to emerge as upstanding, self-reliant members of society. At Bharateswari Homes, they believe in self-reliance and their main motto in life revolves around the three D's - discipline, duty and diligence. Life at Bharateswari Homes begins at 5 in the morning with drill display, cleaning duty and breakfast. Morning classes with tiffin breaks are followed by lunch, rest, cleaning duty again, study hours and dinner. On a typical evening some girls can be seen in the kitchen cutting up vegetables to be cooked for dinner, while others on the veranda are dusting the railings. The dormitories are spick and span, the beds tightly made with the girls minimal baggage stored away to one side. Alongside their regular school work the students take part in physical training and cultural activities. Bharateswari Homes skill in physical display demonstration is nationally recognised. The Homes pays careful attention to the continued improvement of its educational standard. The school, rooted in R.P. Shaha s philosophy which prioritises women s education, has carved a niche for itself in regards to its activities, cultural accomplishments and style which have now become a traditional part of the country s heritage.